There were 603 press releases posted in the last 24 hours and 153,894 in the last 365 days. LOS ANGELES, CA, UNITED STATES, January 9, 2018 /EINPresswire.com/ -- Why is Mr. Desanti and his investor group suing Panama? The same reason David Aven and his investor group is suing Costa Rica. "Two Real" Estate Developments gone bad due to Corrupt Government officials, and "two real" David and Goliath battles. In interviewing Mr. Aven, he revealed learning something interesting about Mr. Álvarez Desanti, a successful businessman and Costa Rica Presidential Candidate. Aven said this, “Apparently the same thing that happened to Mr. Desanti and his investor group in Panama, happened to me and our investor group in Costa Rica. Mr. Desanti's group, bought land in Panama for a real estate tourist project called "Cañaveral Ecotourism Development" with the goal of building a hotel. Their project was issued lawful Government permits, and was shut down by Corrupt Panamanian Government officials over a false wetland claim. "Our investor group bought land in Costa Rica on a beautiful beach in Esterillos Oeste and our development was called the "Las Olas Beach Community". The plan was to be build condos, hotel, beach club and time shares. Our project was issued lawful Government permits, and was also shut down by Corrupt Costa Rica Government officials over a false wetland claim." This reporters question is this, "is there a special school these officials attend to learn how to be corrupt?" Mr. Desanti and his investor group is suing the Panama government for $100 million for the destruction of their investment. Mr. Aven's investor group is suing the Cost Rica Government for a similar amount for the destruction of their investment. It appears Mr. Desanti’s group and Mr. Aven's group are both victims of government corruption, and were both defrauded by the governments of Panama and Costa Rica respectively. The exact same thing could be said about what happened to Desanti and his investor group in Panama! Aven said the following at CAFTA hearing. "Developers spend millions of dollars acquiring land, going through the permitting process and acquiring Government permits, those permits must be respected and honored. It's not a magic trick of now you see them and now you don’t! Developers need to know the Government is stable and will stand behind lawful permits they issue. Developers need certainty that a rogue criminal prosecutor, like Luis Martinez, won’t be allowed , for whatever reason, to shut down a project just because the power he has goes to his head, and he decides he's not going to follow Government law." Aven stated, "Developers have to know that a Government won’t permit a rogue Prosecutor to ignored objective evidence like SETENA Resolutions, an INTA report and MINAE and SETENA reports, all saying there are no wetlands. Then when the developer questions Mr. Martinez about why he didn't accepting the reports findings, the developer won’t have to hear a corrupt Criminal prosecutor tell him, I DON’T BELIEVE THOSE REPORTS!! Aven told the Arbitration panel, "the law is not based on a belief system, it's based upon facts and objective evidence. A competent and un-corrupted criminal prosecutor would know that and would not be saying, I DON'T BELIEVE THOSE REPORTS." Aven continued, “As I testified at the hearing, and it’s on video for all to watch, Costa Rica law is clear. SETENA was the agency granted the authority by the Government and the courts, as the only agency to issue Environmental permits that has the force of law behind them. Once issued, the SETENA resolution findings becomes a Government order that all public and private persons must comply with, even Costa Rica Judges. Mr. Luis Martinez, the Criminal prosecutor, and Mr. Luis Picardo, Director of the MINAE in Puriscal, and others, refused to follow the law. They"re directly responsible for the destruction of the US Investors multi-million dollar investment in Costa Rica, and for bringing a 100 million dollar law suit down upon the head of the Costa Rica Government. Just like corrupt Panama officials were responsible for the 100 million dollar law suit that was filed by the Desanti Group. Mr. Zumbado in his witness statement said: “It’s clearly in Costa Rica’s interest to ensure that foreign investors such as Mr. Aven are not abused by corrupt officials." If this kind of criminal behavior is not eliminated, it will give Costa Rica a bad name and is liable to discourage future foreign investment.” The same is true for Panama. The fact that this is being published and being read by thousands all over the world, is giving Costa Rica and Panama a bad name. Aven concluded: “I hope Mr. Desanti will not be criminally charged by a corrupt Panamanian Criminal prosecutor and reported to INTERPOL, as I was falsely criminally charged by a corrupt Costa Rica criminal prosecutor, and as a revenge tactic, then referred to INTERPOL to be red noticed. I hope Mr. Desanti won't be accused of Duping the Panama Government, as I was falsely accused of Duping SETENA by Costa Rica's attorney." It's clear to this reporter that corruption is the number one issue on the minds of Costa Ricans in the upcoming Presidential Election. Perhaps Mr. Desanti’s "corruption experience" in Panama, will make him more determined than ever, if elected President, to make "stopping Corruption" in Costa Rica, a "top priority" in his Administration. 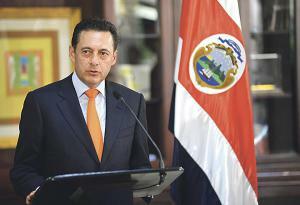 Whoever is elected President needs to make "stopping corruption" in Costa Rica "the top priority". 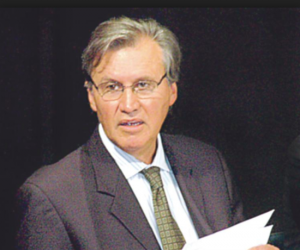 If not, then Fernando Zumbado’s prophecy will come to pass and ongoing corruption will start to negatively impact foreign investment, tourism and International business in Costa Rica. Click to see testimony video from the CAFTA hearing at the World Bank. See CAFTA submission filings on ITA Website. Watch for more corruption reports and visit our website at CRBUZZ.com.